We like to collaborate at the DIG. Working together on real-world projects gives us a ton of joy, a bunch of motivation and a real purpose to learning and applying new skills. Doing all this together, makes it just a little bit easier. Check out the projects below to learn more about what we are up to and how we like to work together. This fall at the Deason Innovation Gym a team of 16 students, 4 student coaches and 3 staff and faculty worked together every Tuesday night for two months to imagine, design, prototype and build a regulation foosball table. 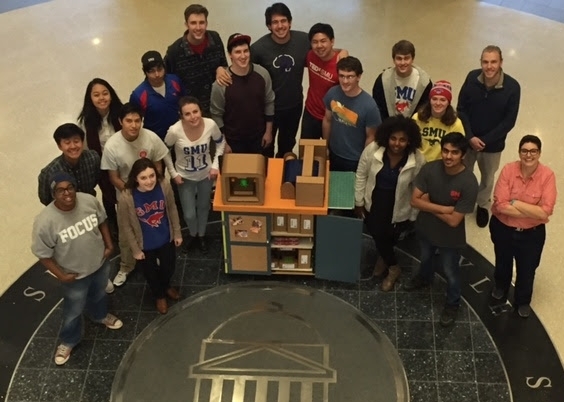 By the time they were done, they had not only created a full-sized foosball table, but also decked it out with SMU-themed and 3D-printed horsetail-shaped handles and mustang players. LED lights brightly illuminated the table’s field, framed by a sensor-based score advancing system. Built-in speakers pumped tunes from a smartphone for a game time soundtrack. In early January 2016, the Deason Innovation Gym hosted a seven-day Immersive Design Challenge. Immersive Design Challenges (IDCs) are client-driven, open-ended projects our students intensively work on for 5-7 days. We recruit both corporate partners and projects with social impact, and craft a challenge for a student team to build something for the real world. Students thrive on the intensity of these projects, sometimes voluntarily working through the night. Students often cite IDCs as one of the most impactful experiences from their time at SMU. This spring students at the Lyle School of Engineering endeavored to solve a problem: how can a student who loves kayaking but doesn’t have a car still get off campus and out on the water? From this simple problem came a challenge. Could we design and build a fully-functioning foldable human-powered boat that cost less than $100 in materials and could be carried on a bicycle for the ride from campus to White Rock Lake (a 4 mile ride)?